Do you need braces but don’t want all the wires and brackets? Then Invisalign might be for you! Invisalign are custom made clear aligners that are specially created to straighten your teeth without the unsightly look of traditional braces. 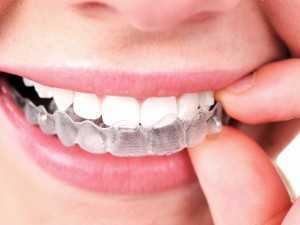 Each aligner is worn for about two weeks for a period of six to eighteen months, depending on your needs. Invisalign is especially great for adults but kids whose teeth, including molars have already grown in, can take advantage of this latest technology too! If you’re interested in Invisalign, speak to one of our trained and certified Align Technology team members to see if it’s right for you.